Power Purchase Agreements (PPAs) are a widely available method to finance distributed energy generation projects such as rooftop solar panels or landfill bio-gas. These agreements are legal in at least 26 states, including Virginia, Ohio, Pennsylvania, Maryland, and Georgia, but are NOT available in West Virginia. In short, a third-party developer installs, owns, and operates a distributed energy system on a customer’s property. The customer purchases the system’s electrical output at a fixed rate— generally lower than that of the local electric utility— for a predetermined time period, usually 15-25 years. Eligible energy resources include but are not limited to solar, wind, run-of-river hydropower, geothermal, biomass, natural gas, and combined heat/power (CHP). 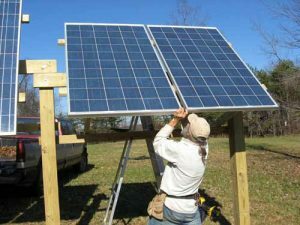 Homeowners, businesses, farms, governments and municipalities, schools, churches, and non-profits would all be able to utilize PPAs. You can learn more about them by checking out West Virginians for Energy Freedom, a coalition backing smart legislation to make PPAs available in West Virginia!